Today, I read an article in “People” magazine (a guilty pleasure of mine!). I’m a bit behind, so the news is not “news” per se. I even tweeted about how the world had lost an inspiration the evening the news broke (06/29). At the time, I was in NYC and saw it on the evening news. I naively did not know that she was in her 70s, and I didn’t know she was ill (as apparently, many people didn’t know). What I also did not know is that Nora Ephron “knew” what people should order as their meals. 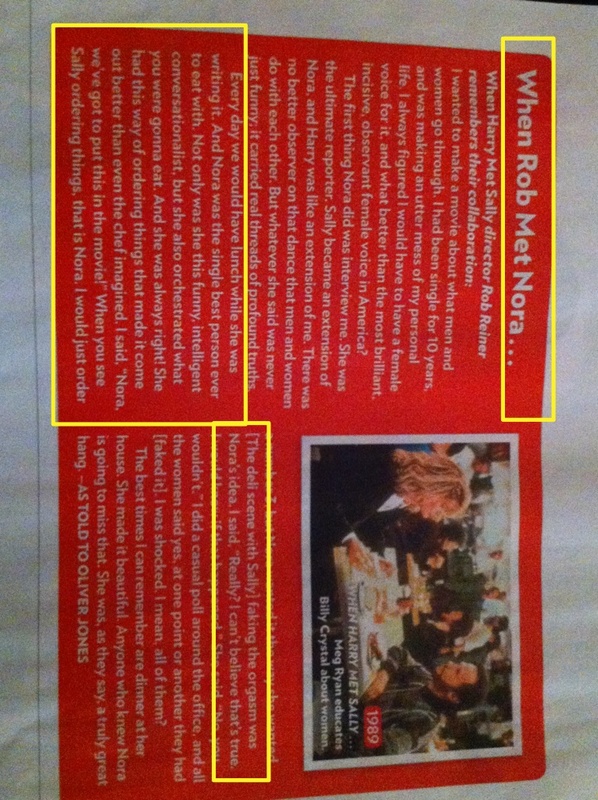 I love this excerpt from an interview with the beloved Rob Reiner (see highlighted sections below). Image courtesy of “People” magazine, issue dated 07/16/12. Y’all, “When Harry Met Sally’s” “big scene” was fashioned after Ms. Ephron’s notion of ordering what’s best for her companions!! *She Ordered What?!? * before I even figured this thing out! I’m delighted to know tha such a highly regarded woman would take the reins and modify an order for a friend, as well as know when to throw an “unpretentious dinner party… with the most delicious hot dogs.” (per her friend Sally Quinn) It reminded me of the time I made grilled cheese and pesto paninis with homemade tomato soup for girls’ night dinner, and my friend LOVED the dinner! Sometimes, a dinner doesn’t require fancy fare; just good company and memorable food! I can’t pretend to believe that Nora Ephron and I have much in common – she’s a legend, plain and simple. However, I’m encouraged to know that a highly influential woman was a bit unconventional when it came to ordering food, as am I. Sometimes the less fancy cooked meals at home are the very best! Jerod and I recently made grilled cheese for dinner and it was super fun! Haha I’m not sure my guest post would live up to the first post by Jerod. But I’ll see what we can do!